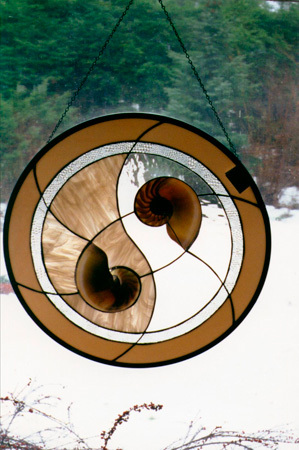 This piece is a symbol of each individual's effort to create balance in his or her life. The yin/yang shape reminds us that we are all made up of strong yang (male) characteristics as well as gentler yin (or feminine) energies. The dots are represented by nautilus shells ... their spiral shape represents the spiral of change which seems to be constantly accelerating. The nautilus shell itself is a source of personal inspiration. Each compartment in the shell reminds me of various times and phases within my life ... each one building on the other to produce a unique person. These parts of my life are connected to form a complete whole ... likewise the nautilus has a small connection between all its compartments.